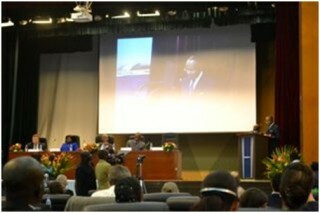 The PEGAS Project manager attended the 14th Anchor Conference of the Congo Basin Forest Partnership (CBFP), held in Brazzaville, Congo on October 6-10. 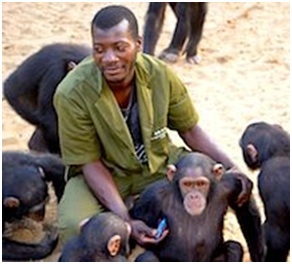 The purpose was twofold: to meet people and organizations that could be useful to the PEGAS objectives; and to visit the Tchimpounga Chimpanzee Rehabilitation Centre, managed by the Jane Goodall Institute, to discuss great ape trafficking, assess the facility as a possible site for relocation of confiscated chimpanzees and learn about sanctuary operations. The conference was largely a talking shop with many complicated, theoretical presentations of little relevance to what is actually happening on the ground in Central African forests. No one seemed to think it odd that not a single Asian government, NGO or private sector entity was a partner in the CBFP, nor were any Asians amongst the participants (except for one Japanese). Since Asian extractive industries (mining, logging, oil and gas) are causing devastating damage to Central African biodiversity, it calls into question the whole purpose of the CBFP. See Flying under the radar for a case study involving Chinese extractive industries in great ape habitats. The CBFP, whose objectives include conserving forest habitats and biodiversity, while maintaining an important carbon reservoir, apparently forgot to include any partners from Asia. Asian extractive industries operate largely outside initiatives aimed at conserving biodiversity. The visit to Tchimpounga was a delightful experience. Rebeca Atencia, the manager, and her husband Fernando Turmo, shared a wealth of information on the admirable work that they and staff are carrying out there. The centre’s 166 chimpanzees and about 20 mandrills are receiving the highest standard of care. 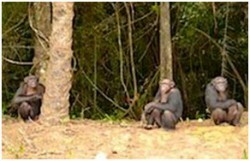 Of particular interest are plans and preparations to begin a program of release into the wild of Tchimpounga chimpanzees. Three islands in the Kouilou River, which offer ideal forest habitat, are receiving chimpanzees that will undergo pre-release training to teach them how live off wild resources. Once they are ready, they will be released in groups in an area already selected in the nearby Conkuati National Park. Tchimpounga is also carrying out an effective campaign of creating awareness amongst the public aimed at reducing great ape hunting, bushmeat trade and the trafficking of orphans. This entry was posted in CBFP, conferences, Congo Republic (Brazzaville), PEGAS, sanctuaries and tagged CBFP, conferences, Congo Republic (Brazzaville), PEGAS, sanctuaries. Bookmark the permalink. Enter your email address to follow PEGAS and receive notifications of new posts by email. PEGAS has launched an Indiegogo crowd funding campaign. Please visit our campaign page and give whatever you are able to. Sign our petition to stop great ape slavery! Why are great apes treated like second-class species by CITES? How did Ebola Zaire get to Guinea?